APPLETON — Zachary Fowler, the boatbuilder from Appleton who survived 87 days in the Patagonia region of South America to earn the $500,000 grand prize on this season’s “Alone” series on the History Channel, can finally talk about his winning effort. “It feels good; it’s been pretty wild,” Fowler said Friday, one day after the final episode of Season 3 aired. Zachary Fowler had to videotape himself during his time alone in the Patagonia region, and he came to count on the camera. Although he has known the outcome of the program since he returned to Maine last fall, Fowler managed to keep the results under wraps. “It feels like I was writing a book (as the episodes aired), but I wasn’t letting anyone know the ending. Now everyone knows the ending!” he said. Fowler grew up in Vermont and came to Maine to pursue an interest in boatbuilding. Having learned the craft at shipyards along the midcoast, he put down roots in the area when he was 21, purchasing a 2½-acre parcel of wooded land in Appleton, where he and his family now live. Fowler, his wife, Jami, and their two daughters live off the grid in a yurt that he built, and practice a sustainable lifestyle. Fowler didn’t let the blizzard-like conditions Thursday night prevent him from watching the finale of the show with friends at Threshers Brewing Co. in Searsmont, where he has been holding informal viewing gatherings since the show premiered in December. “I don’t mind watching myself. It’s been a lot of fun to watch the show with a group of people. They get to laugh with me, they might tear up with me. The hardest part of watching the show has been when I see the other (contestants), when I see how much weight they lost,” he said. Fowler and his castmates were scattered along the hilly, rugged Patagonian terrain many miles from one another. They never had a chance to see each other while they competed, and during their stay were tasked with videotaping themselves. No camera crews were at the campsites, and the only people to visit were a medical team that made sure none of the contestants was at risk of starvation. After days of heavy rain, the dock that Fowler had built to fish from was partially submerged in water, and he hadn’t eaten for some time. While attempting to bring a fish in, it fell from the line and back into the water, and Fowler’s frustration could be sensed by viewers. “I hadn’t gotten a fish in days, and I was just boiling the fish bones in water and drinking it, trying to get whatever minerals I could out of it. I wasn’t getting anything accomplished, so I patched a hole in the roof (of the hut), but I was really waiting for the other people to leave. Fowler said his family was his constant source of inspiration and motivation during the nearly three months he spent alone in South America. Fowler said he did whatever he could to keep both his mind and hands busy – whatever it took to keep going. “For the most part I survived with relative ease, being able to discipline my mind and know that I had hope of a better future for my family. But around 4 p.m. every day, when I would ordinarily be home with my family, it was tough. Nights were definitely the hardest,” he said. Returning to Maine victorious, and having secured the grand prize, Fowler has definite plans to build a new house. But instead of hiring an outside company to do the construction, it will come as no surprise to viewers of “Alone” that he plans to be very hands-on and build the house with his two hands and some help from his family. “I’ll get my dad up here from Vermont and we’ll build it together. I want this money to go as far as it can, and I plan to do that by building my house and investing in the Fowler’s Makery and Mischief brand,” he said. 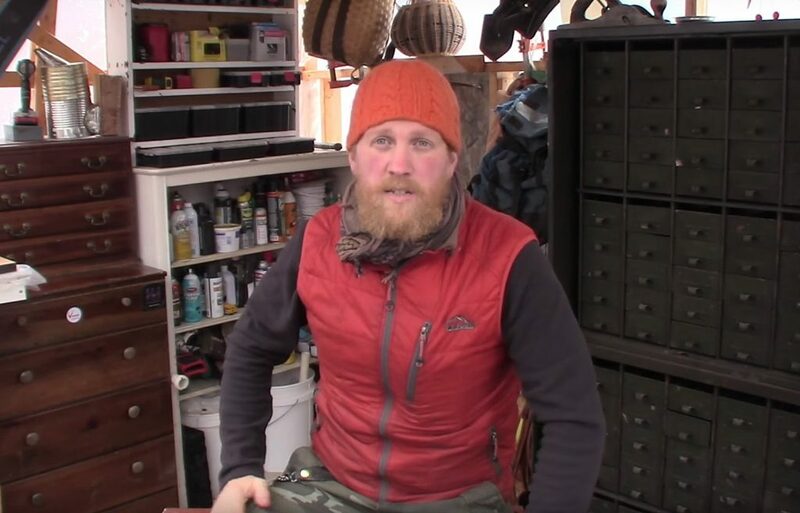 Fowler currently has a YouTube channel, Makery & Mischief, which is devoted to videos in which he teaches viewers how to build tools, furniture and contraptions – many of which are similar to ones he used in Patagonia. Fowler plans to expand the video channel to include a variety of content, and is also considering writing a book about his experience and his homesteading and survivalist acumen. “It feels like I’ve got a five-part book in me: what I did out there in Patagonia, what I’ve done here in Maine. I have journals full of designs from over the years. There’s no limit to the amount of designs and materials I could put together,” he said. In a series of hieroglyphics scrawled into the stick, which Fowler brought home with him, he can remember the specifics of each day spent alone in Patagonia. “I did pretty well (in the 87 days) I was there. I ate 53 fish and two birds,” he said. Fowler also found other creative food sources, such as dandelion roots and large grubs. Fowler described the arduous task of preparing the fish soup, which he would cook and then drink for days at a time. Provided that he caught something, he would then walk down to the edge of the water, fill a bag with a gallon or so of water, bring it up to his campsite, add it to a pot, repeat the trip to gather water, and then bring it to a boil with the fish. By the last episode of the show, Fowler had lost 72 pounds, and looked like a completely different person from the man who had appeared in promotional photos for the program. His positive, down-to-earth spirit is still apparent as he describes the experience, despite the drastic weight loss and the desolation one associates with spending three months in a cold, unfamiliar environment, completely alone. “It was great, I didn’t suffer any adverse effects, and I was able to bounce back really quickly,” he said. On the last day, when he heard the boat coming with the medics, he said he thought they were coming to tell him it was time to go home. Instead, producers surprised him with the news that he had won. “I really didn’t experience any culture shock once I left Patagonia,” Fowler said. “It was a great feeling getting on the plane and being up in the sky. Since I’ve been home, I’ve just been spending a lot of time with my family. That’s what I’m happiest about, and that’s what’s most important to me,” he said.